Recently Ziploc introduced a new zip-top bag with a manually operated vacuum pump. The packaging indicates that pumping the air out will reduce freezer burn, but they seem like they would also be excellent for sous vide. In fact they literally say “sous vide” right on the bags. Since sous vide typically uses vacuum sealed bags, is there any significant difference between normal zip-top bags and using the new bags that can have the air pumped out of them? In particular, is there a measurable difference in the mass loss between the two types of bags? 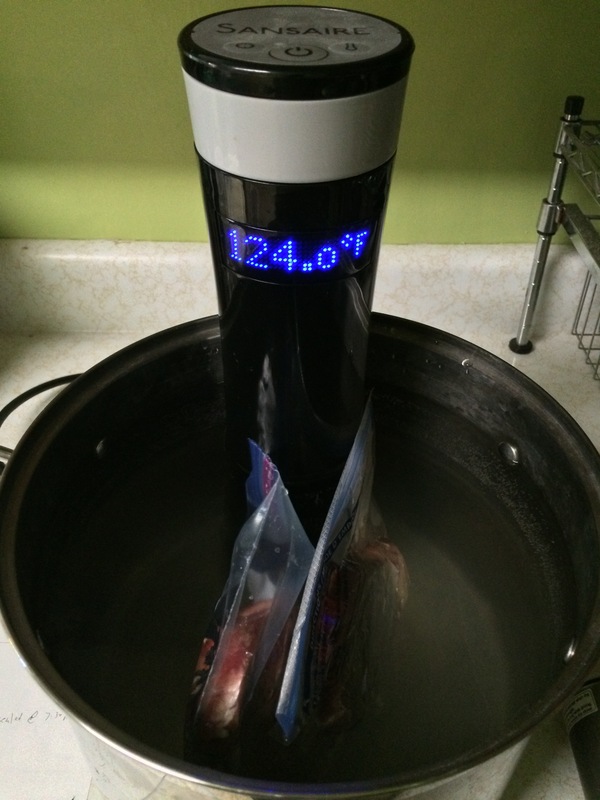 Since sous vide uses a water bath, the density of the water should provide enough pressure that there is no measurable difference between the vacuum bag and the regular bag with respect to mass loss and no noticeable difference with respect to flavor, texture, etc. 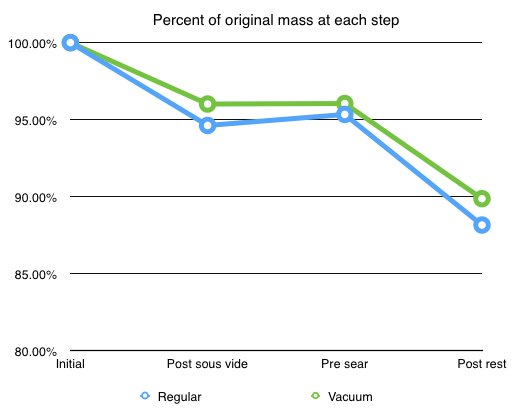 If there is any difference, the vacuum bag may show less browning during the sous vide bath. Mass each of the steaks (initial). Place each steak into one of the zip-top bags and seal them. For standard bag dip bag into water bath to remove as much air as possible and seal the bag. For vacuum bag, seal the bag and use pump to remove air. Fill stock pot with water (we used 10 qt.) and heat water bath to 125ºF. Place bagged steaks into water bath and let them heat for 1 hour. Remove steaks from water bath and their bags. Mass each steak again (post sous vide). Coat both sides of each steak with canola oil (1tsp per steak) and liberal amounts of kosher salt. Mass each steak again (pre sear). Place the case iron skillet over high heat and bring it up to 450ºF (as indicated by infrared thermometer). 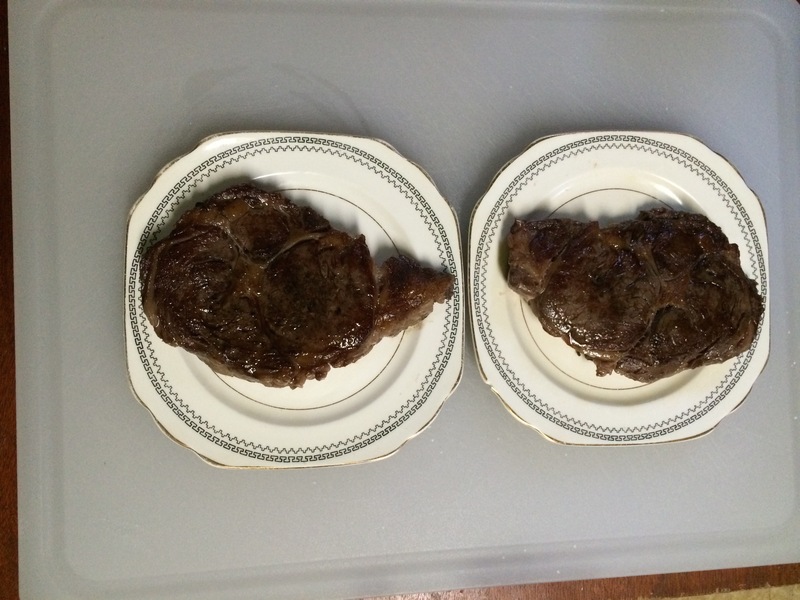 Place both steaks into the cast iron skillet (be careful to keep track of which steak came out of which bag). Sear both steaks for 1 minute on each side. Remove steaks to plate and cover with aluminium foil. Let steaks rest for 5 minutes. Mass each steak one last time (post rest). 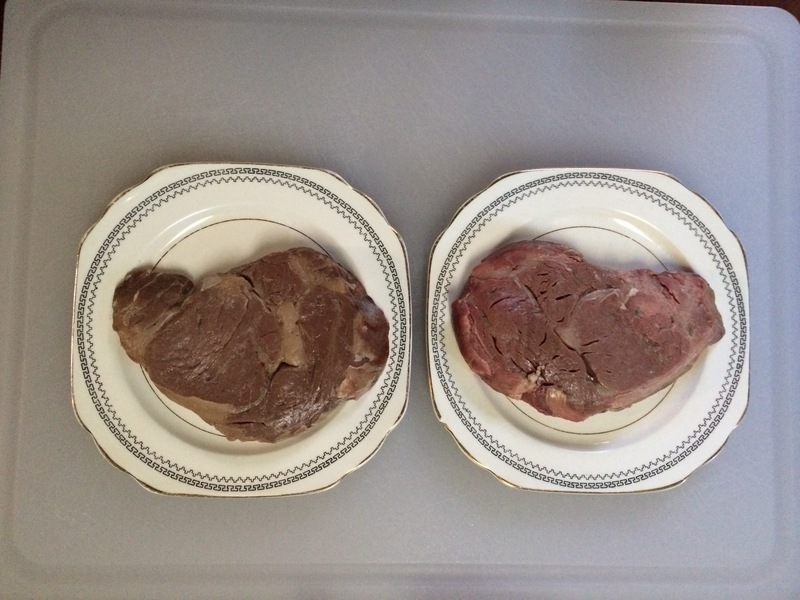 Before starting, both steaks were photographed for comparison with how they look after being sous vided. It was expected that the vacuum sealed steak would show less of a color change. Steaks fresh out of their packaging and ready to go into their zip-top bags. The steaks were then placed into their zip-tob bags and the bags were sealed. To get as much air a possible out of the non-vacuum bag, the bag was placed mostly under water to displace the air, then sealed. 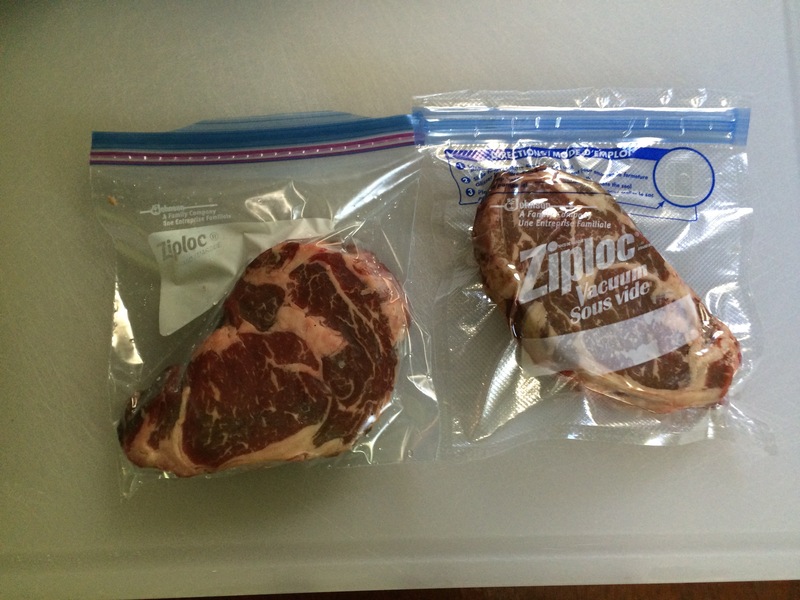 Steaks sealed inside their zip-top bags. Standard freezer bag (left) and Vacuum sealed bag (right). Since we failed to heat the water before sealing the bags, 20 minutes passed while the water heated. During that time a small but noticeable amount of fluid did leak out of the vacuum sealed steak. It’s possible a similar amount of fluid came out of the other steak, but it was less noticeable due to the air that was left in the bag. Once the water was heated, the steaks were ready for their hour long bath. 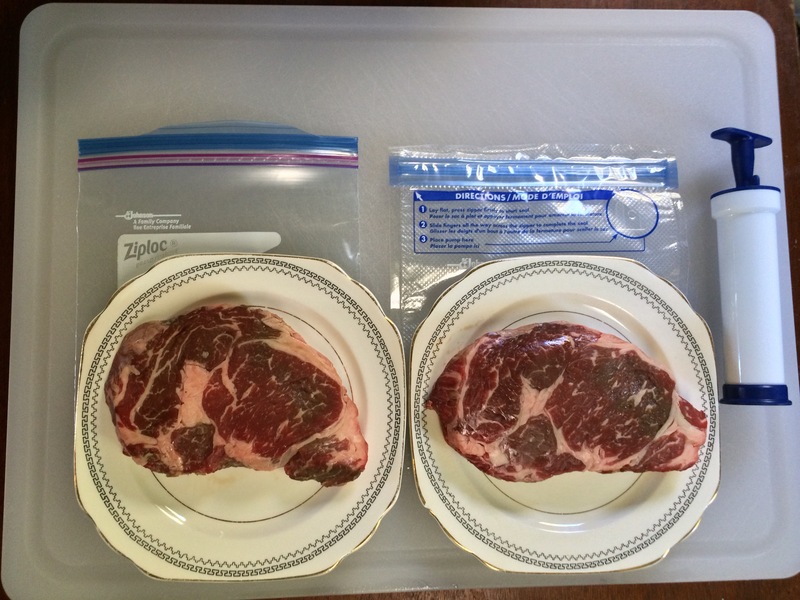 Steaks in water bath sealed inside both a regular freezer bag bag (left) and vacuum sealed bag (right). The vacuum sealed bag floated much lower in the water. As you can see in the above photo, the top of the steak in the non-vacuum bag (left) is actually poking above the water’s surface. After an hour, the steaks were removed from their bags and patted dry. A dry surface is apparently important for getting a good sear, most likely due to the Leidenfrost effect. We still need to do science to this practice though. Sous vided steaks patted dry. Regular freezer bag steak on the left, and vacuum sealed steak on the right. The steak that was in the vacuum sealed bag did in fact retain its color better. The steak were then prepared for searing, and seared one minute per side. The steaks then rested for 5 minutes and were ready for taste testing. Steaks rested and ready to taste test after their high heat sear. The masses of each steak was recorded several times throughout the cooking process to determine if there was a difference in mass loss due to the difference in bag technologies. Relative masses at each stage of cooking. While the steak that was in the non-vacuum sealed bag did lose slightly more mass as a percentage of its original mass, the difference is small enough that it probably isn’t statistically significant. We would need more samples to be sure though. As for the taste and texture of the steaks, no noticeable differences between the steaks were detected by Brownie Master P or myself in terms of taste, texture, flavor at juiciness. Since the type of bag used has little effect by the time the steak is consumed, considering the cost per bag may be useful. The vacuum sealable bags are roughly twice as expensive per bag, but at only 25¢ per bag for the vacuum sealable bags the difference is tiny. So it’s probably worth it in terms of the improved behavior in the water bath as well as the fun of using the vacuum pump. While there was no noticeable difference between the steaks in terms of quality, and only a small difference in terms of mass loss, the bags are indistinguishable based on the finished steaks. However during the cooking process several major differences were noticed. The first was that the vacuum sealed bag floated much lower in the water allowing the water to completely cover the meat. The vacuum sealed steak also retained more of its reddish surface color. While there was little difference between the bags while cooking, would there be a difference in their intended purpose, long term frozen storage? Does patting the meat dry actually matter? How important are the canola oil and salt? How many times can I use science as an excuse to cook delicious steaks?